For centuries Scotch whisky has been one of the most sought after tipples in the world. There are few drinks that can boast such a high standard of quality, provenance and heritage and as a result of such remarkable characteristics, Scotch whisky is now consumed in every corner of the globe. 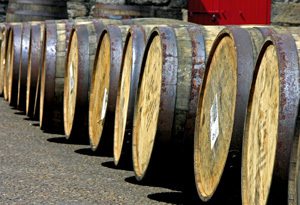 The history of Scotch whisky echoes that of Scotland itself. Its ancient Gaelic roots, rebel status in the eighteenth century, and its expansion around the world are all mixed in with this culturally rich and geographically varied small nation. Traditionally blended Scotch whisky was king and each major brand would be headed by the exalted figure of the master blender, who would use his expertise to mix whiskies from all over Scotland into one. Although many excellent blends remain there has been explosion of single malt brands in recent decades, allowing drinkers to appreciate the individual character of locally crafted and sourced whisky from right across the country’s varied landscape. There four main Scottish whisky regions, Islay, Highland, Speyside and Lowland. A single malt from each are endowed with the geology of that region. For example, a heavily peated Islay malt such as Bunnahabhain is a world apart from the smooth caramel notes of a classic Speyside, such as Glenlivet. Although Lowland single malts are generally the least well known, impressive offerings such as Auchentoshan Three Woodare doing a great deal to change this.